“The Mighty Maple” from Christian Faith Publishing author BB Philip is a beautiful picture book that presents a scenario in which trees can talk, sharing interesting stories and profound observations about life through everything they’ve heard and seen—which is what a young, soon-to-be-great maple tree learns firsthand from her mother as she listens to stories of times past and collects advice for the future as mother and daughter weather the seasons together. “The Mighty Maple”: an enduring story of a mother tree’s stories and advice to her daughter. “The Mighty Maple” is the creation of published author BB Philip, a married mother of two grown children who lives in rural Pennsylvania, where she loves to go for walks in the woods and work in her garden. Philip shares the sage advice of Mother Maple to the young Mighty Maple, “‘I have seen many things in my lifetime, daughter. Listen to my teachings and remember. Published by Christian Faith Publishing, BB Philip’s new book beautifully illustrates the long-standing tradition of verbally passing down lore and wisdom to help firmly ground young ones in context of history and with ample guidance for facing the uncertain future. BB Philip, a lover of nature and of children, combines both in this unforgettable story to teach children to stand strong and remember their roots. View a synopsis of “The Mighty Maple” on YouTube. 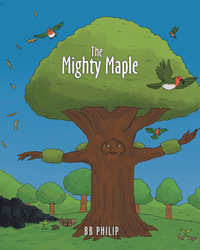 Consumers can purchase “The Mighty Maple” at traditional brick & mortar bookstores, or online at Amazon.com, Apple iTunes store, or Barnes and Noble. For additional information or inquiries about “The Mighty Maple,” contact the Christian Faith Publishing media department at 866-554-0919.